Your car’s coolant is toxic—so be sure to test it regularly, replace it if needed, and discard the used liquid safely by following these guidelines. Changing your antifreeze is an important part of preparing your car for cold weather. Antifreeze (also known as coolant and radiator fluid) is a liquid agent that prevents your engine from overheating in summer and seizing up in winter. Over time, coolant can become overly acidic, leading to engine damage and overheating. In older cars, antifreeze can leak, lowering levels and requiring a top-up. Newer cars use a longer-lasting cooling agent, typically 50 percent water and 50 percent antifreeze; the addition of plain water to cool your radiator can dilute antifreeze levels below this ideal 50/50 ratio. The main ingredient in antifreeze is usually ethylene glycol, which also acts as a lubricant and anti-corrosive agent—a toxic chemical that cannot be poured down the drain, toilet, sewer, or thrown in the trash. Even brands marked “non-toxic” or “less toxic” should be disposed of using the safest practices for handling hazardous waste. Most car manufacturers recommend changing antifreeze every 30,000 to 60,000 miles (check manufacturer’s guidelines or ask your dealership for recommendations for your model). Testing, disposing of, and changing your car’s coolant isn’t hard, but it does require knowledge of your engine as well as recycling and hazardous waste laws in your area. 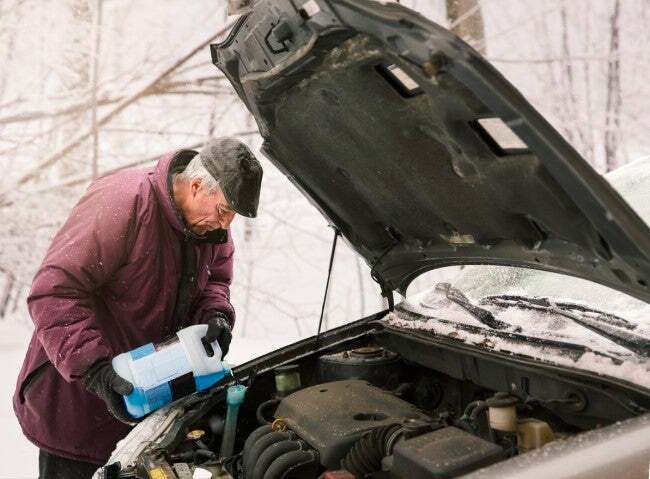 Read on to learn the safest method for how to check and dispose of old antifreeze. 1. Test antifreeze fluid levels and quality to determine if it needs to be emptied and changed. Antifreeze is located in the radiator. First, park your car on a level surface and let the engine cool completely. Unscrew the radiator cap and look inside to ensure that the fluid reaches the top of the radiator—or to the “full” mark. Even if there’s enough antifreeze in the radiator, you should test it to determine if it needs to be changed. The liquid can be transparent or dyed red, orange, or blue, but—regardless of color—it should appear bright and clear. Check the quality with a coolant tester ($6.95 at Walmart), which comes with instructions for interpreting results. You’ll stick the hose into the antifreeze, squeeze the bulb to draw in some liquid, and read the gauge, an indicator of the lowest temperature the antifreeze will protect against. While the radiator cap is off, also look for any oily film on the surface of the antifreeze. This may indicate a problem with the head gasket and should be checked by a mechanic immediately. Even a tiny amount of oil or gas will ruin antifreeze. Cloudiness, a strong smell, or particulate matter means must change the antifreeze. 2. Find a hazardous waste or recycling facility. Your state’s Department of Waste Management website will list guidelines and centers for recycling or disposing of antifreeze. Locate a convenient recycling or disposal site and call to ask how to contain and document used antifreeze. If the antifreeze is tainted with oil or gas, it is considered contaminated and cannot be recycled. In this case, search the website for hazardous chemical disposal. You can also contact are your local recycle center, local government, mechanic and automotive shops for help with used antifreeze disposal. Earth 911’s Recycling Locator is a handy searchable database. Just click “antifreeze” and type in your zip code to find recycling facilities in your area. 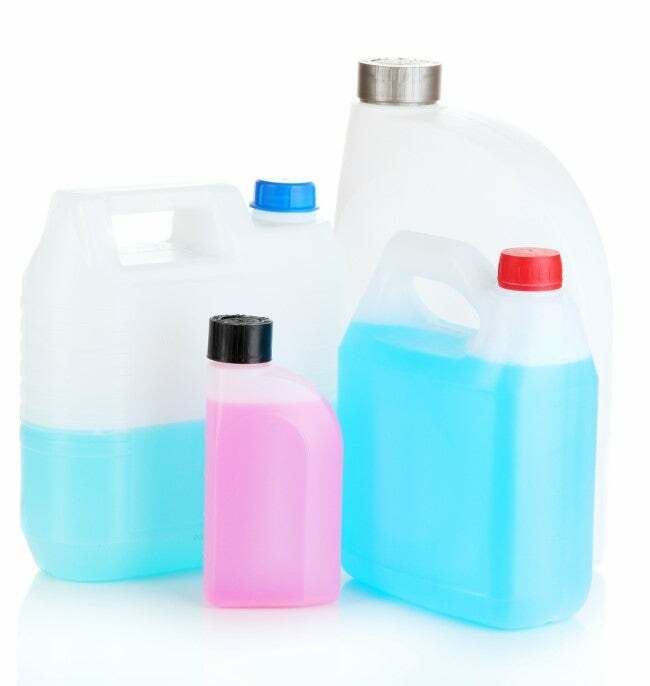 Authorized landfills will accept used, non-contaminated antifreeze; call your local landfill and ask if they have a tank for used antifreeze disposal. 3. Drain the radiator of old antifreeze. Always use safety equipment—goggles, mask, and gloves—when draining your radiator and replacing antifreeze. To remove old antifreeze, park on a level surface and allow the engine to cool completely. Disconnect the battery before you drain your radiator; this ensures that no electrical damage will occur. Place a drain pan under the drain valve, then open the valve with pliers. Let the liquid antifreeze drain into the pan completely before tightening the valve again. Transfer old antifreeze into a sealable plastic container. Check your car’s owner’s manual or contact the manufacturer to determine how much replacement antifreeze is needed, or what proportion of antifreeze and water you should pour into the radiator. 4. Clean up quickly and conscientiously. Even the most careful mechanic experiences an occasional spill. 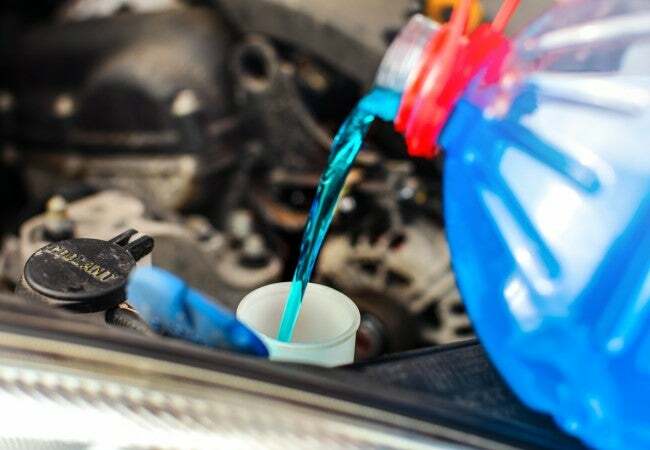 Since antifreeze is a toxic chemical, you must absorb all spilled liquid immediately. Use sand, baking soda, or kitty litter to soak up as much of the mess as possible. Next, cover the entire area with a layer of paper towels and let sit for one to two hours. Use more paper towels to collect all the spilled antifreeze (as well as absorbent materials), and toss into a sealable plastic garbage bag. This bag can be placed in your normal outdoor trash can, as long as it is not accessible to children or animals. Finally, clean the stain by squirting liquid soap on the affected area and scrubbing with a sponge or scouring pad. Rinse with water and towel or air dry. 5. Secure and transport the sealed bottles safely. Transport old antifreeze in sealed, plastic containers. Make sure the containers are well secured on the floor of your back seat or trunk, using a cable to keep containers in place if necessary. Label each container with the date you changed your antifreeze, as well as the brand/chemical contents of your antifreeze (if known). The main ingredient of antifreeze is either propylene glycol, ethylene glycol, or methanol, each of which has slightly different toxicity levels. If your antifreeze is polluted with gas or oil, make sure you note what chemicals (if known) were added to the coolant. Remember that only pure, used antifreeze can be recycled; antifreeze with traces of gas or oil must be disposed of at a hazardous waste facility.